In early European trade this morning, gold was trading at $1254, up $19 since last Friday’s close. Silver was at $18.26, up 27 cents on the same timescale. Gold and silver broke out on the upside from a two-week consolidation yesterday, with gold breaching the $1250 level, and silver clearing $18.00. Comex volume has picked up on these break-outs, characteristic of a bullish move. In early European trade this morning, gold was trading at $1254, up $19 since last Friday’s close. Silver was at $18.26, up 27 cents on the same timescale. Gold this year has been all about the dollar trade. The dollar peaked in the week before Christmas, and gold bottomed. The dollar trade-weighted index fell 3.5% during January, and gold rallied. Gold’s February consolidation has been at a time of a small countertrend rally for the dollar. Nonetheless, gold’s performance has been more positive than the dollar’s moves would suggest. 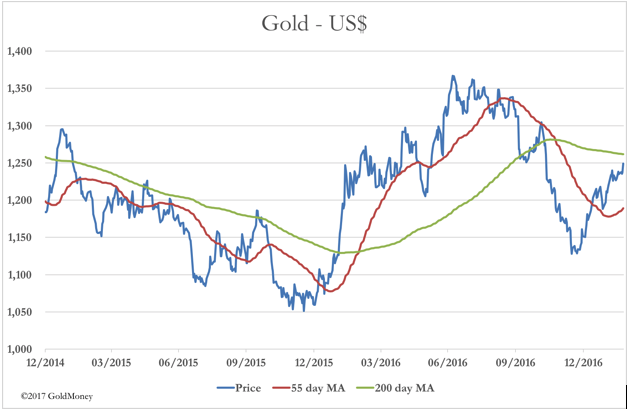 The next chart shows gold with the moving averages important to chartists. They will look for some consolidation at the 200 day moving average. Silver has been on a different tack, tracking the base metal market. This difference is reflected in silver’s open interest on Comex, which has been climbing, just like the OI in other metal contracts. Gold’s OI has remained remarkably suppressed, telling us the action here is counterpart to the dollar itself. Having rallied strongly into December, the dollar is now at a crossroads. The Fed has indicated it is prepared to raise the Fed funds rate in small steps, and it is fifty-fifty whether the target rate will go up 0.25% in March. The unemployment rate is below the 5% target, and the inflation rate measured by the CPI is now above the Fed’s inflation target. There is therefore no alternative to higher rates, but given the debt overhang, it is understandable that the Fed intends to move cautiously. Inflation rates are picking up everywhere. In the Eurozone, the CPI rose 1.8% in the year to January. In the UK, the CPI also recorded a rise of 1.8% to end-January, while in the US it recorded 2.5%. The reasons are partly due to commodity price rises, and partly increased economic activity. 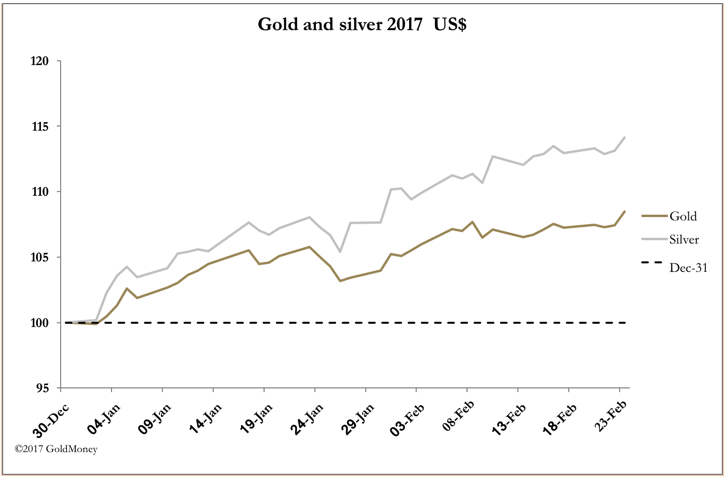 Russia may become increasingly important to the gold price, not only because they are aggressively adding to their reserves. After all the difficulties from the collapse in the oil price a few years back, the Russian State’s finances are in a remarkable, no-debt position. By the end of this year, Russia will have repaid all the foreign debts incurred under the USSR, and has been writing off debts owed to her by Cuba, Iraq, Mongolia, Afghanistan, and Syria. This is remarkable, and it means that Russia cannot be leaned on again financially by unfriendly Western states. It also leaves her free to attack the dollar by buying gold, should she wish to. It is more than likely, that as a major gold producer, the state also holds bullion undeclared as foreign reserves. This is a clear signal that the US’s intelligence community’s long-standing attempt to destabilise Russia has failed completely, and will form the background to the negotiations between Putin and Trump, likely to take place this year.